After November and December’s rains, this dry spell of weather is bliss for gardening and perfect for getting a flying start on the year. 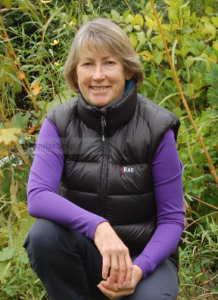 Dormant perennials can be divided to make more plants for free; deciduous shrubs, hedges, some tough evergreens and certain climbers can be cut back; and it’s the ideal time to put in new hardy shrubs, perennials, trees and fruit. Needless to say, there’s usually plenty of weeds to tackle, too, along with maintenance jobs like pressure-washing paths and patios. Despite only being mid-January, in my sheltered corner of West Devon it feels like spring is just around the corner. Hence, I’m walking the gardener’s tightrope of getting ahead as much as possible to steal a march on the busy spring season, balanced with leaving enough dead and dormant growth to protect plants and wildlife in case the weather does the dirty on us. The aristocratic climber Wisteria is a must to prune now in order to form stubby spur-like shoots that will bear gloriously long racemes of fragrant flowers this spring. Hopefully last summer the masses of long, whippy side shoots were pruned back to 5-6 buds from the main stem (if not, make a diary note now) and these should now be reduced further to 2-3 buds. One of the questions I’m frequently asked is how to encourage healthy yet shy-blooming wisterias to perform well, and along with this style of pruning, next month give an application of sulphate of potash – this is a major nutrient that flowering and fruiting plants need to perform well. 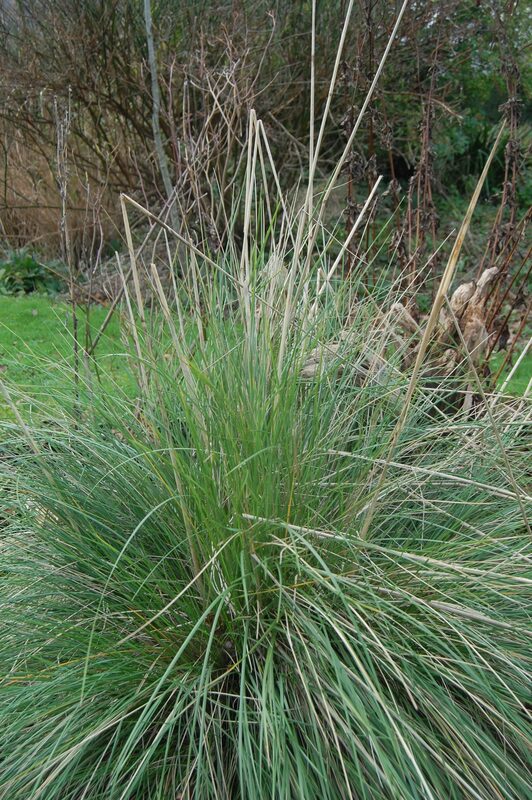 The deciduous grasses I grow – Miscanthus, Calamagrostis and Hakonechloa – all hold their structure really well for several months after dying back, but suddenly start to fall apart now and are frankly making a mess with leaves shedding and being scattered by the wind. 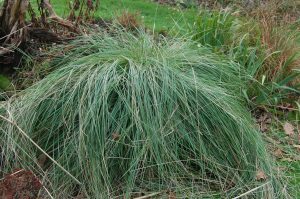 Using either shears or a lightweight hedgetrimmer, I cut all the growth back to ground level or, in the case of Miscanthus, to about 10 cm to protect the emerging new shoots. 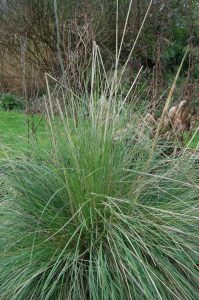 But don’t apply the same treatment to evergreen ones like Stipa and Carex, which are likely to register their disapproval by dying! Instead, get up close and personal, working your fingers as far into the clump as possible to snap off the dead ‘flower’ stems, then comb through to gently loosen and pull out dead leaves. 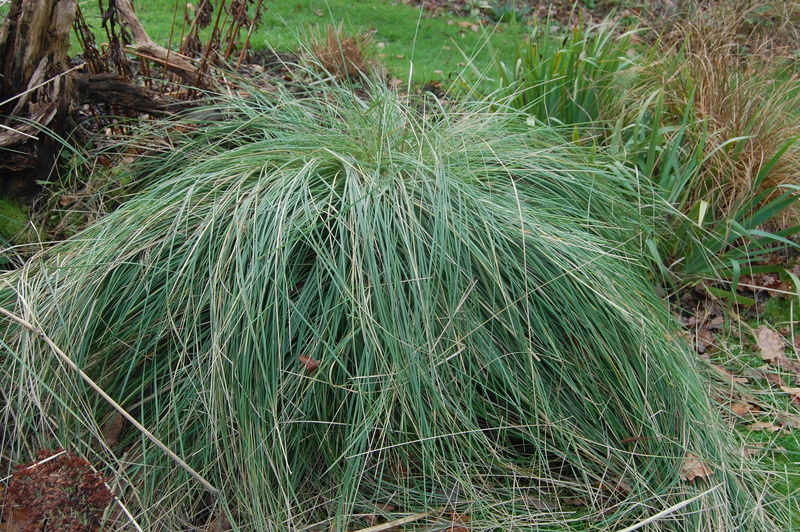 Although established clumps of grasses can be divided, don’t touch ‘em yet – wait until spring. Dividing herbaceous perennials, however, can be tackled right now and this is a fantastic way to bulk up your stocks and get more plants for free. Once plants have formed good-sized clumps (so at least three years old), simply dig them up, separate into good-sized chunks that each have plenty of roots and shoot buds, and replant into soil that has been refreshed with organic matter such as garden compost or well-rotted manure plus some slow-release fertilizer. I say ‘simply’ but digging up and splitting large clumps can be a hefty job. First dig round the outside of the plant using a fork or spade, then work underneath to loosen it. To split fibrous rooted plants like herbaceous geraniums and Japanese anemones, insert two garden forks back to back and lever apart, repeating as necessary. If the plant is old, chuck out the congested woody centre part of the clump. Fleshy-rooted plants such as Hosta need cutting up: though it sounds brutal, something like an old hand axe is ideal (or a sharp spade or breadknife). This ‘major surgery’ really rejuvenates plants and they’ll grow with a fresh lease of life. Weather forecasts are talking ominously about the return of cold easterly blasts, so with memories of the damage wrought by last year’s ‘Beast from the East’, I have preparations in hand for speedy frost protection if needed. The greenhouse heater is cleaned, checked and ready to plug in; piles of dry bracken and fern fronds conveniently close to tuck up tender plants; and insulating materials (horticultural fleece and that handy packaging material that’s like huge bubble-polythene) ready to wrap them up in ‘double duvets’. Susceptible container plants are already standing close against south and west-facing walls: these sheltered microclimates are valuable growing spots and the few degrees temperature difference can make the difference between life and death. This was amply illustrated in autumn when the tender sage Salvia leucantha sailed through hard early frosts in October, while border-grown plants just a couple of metres away blackened and died. Birds start to get active as soon as the year has turned and the days start their blissful lengthening towards spring, checking out nest sites and singing to mark out their territories. I’m pressing on with my pruning as much as possible so they can scout for nesting spots undisturbed, particularly around favoured sites like dense, thorny pyracantha, twiggy honeysuckle and thickly growing ivy. In places I prune deliberately to create good spots for nests: shortening several stems to create a cup-like spot, for example, rather than making one big clean cut. My feeders are a whirl of activity at the moment as birds need plenty of fuel for all this activity, and I’ve stocked up on supplies pf sunflower hearts and fat balls in case the temperature plummets. Later this month I’ll be sitting down for an hour and recording them all for the 40th anniversary RSPB Big Garden Birdwatch – the subject of my next post.